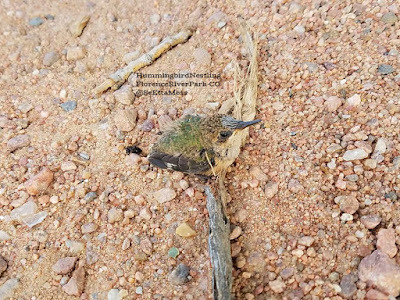 Yesterday I drove over to Florence River Park, a small nature park on the far east edge of Florence, CO. As I sat in my car for a few minutes I spotted a hummingbird 20-25 feet in front of my car. It hovered a few feet off the ground then went down to the ground which piqued my curiosity. When I got it in my binoculars I was stunned to see that it was on the ground feeding its baby. And, ye gads, it was in the parking lot where it was could be run over by a vehicle, grabbed by one of off leash dogs that are common here or even stepped on by someone as it was difficult to see. So I got out to move it, or get to move on it's own if it was able to fly, to a safer location. The pics above and just below show the young hummer on the ground in the parking lot.